This week is a special week because there are two giveaways! But today's giveaway is not the usual kind I do on this blog. 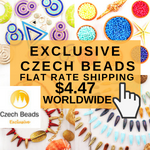 It's actually a blog hop organized by Blue Buddha Boutique, a Chicago based chain maille supplier. There are many opportunities to enter for the freebies. It'll also introduce you to new blogs and bloggers! Blue Buddha Boutique was founded by Rebeca Mojica. 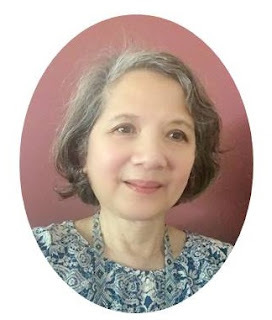 I wrote about her experiences writing her first book, How a Jewelry Book Got Published and subsequently, Chain Maille Book Review - Chained. Blue Buddha Boutique sells artisan designed kits and instructions (for either right or left handers) in addition to general supplies. As chain maille is an increasing popular technique, Rebeca recently came up with several starter kits. I asked her what inspired her to do so. She said,"Actually, the real question is, why didn't I come up with them sooner?!? 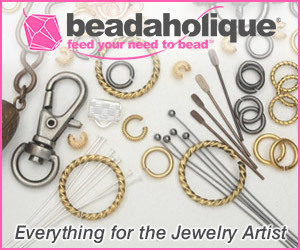 From working at bead shows, I know there is a definite demand for quick-and-easy starter packs. 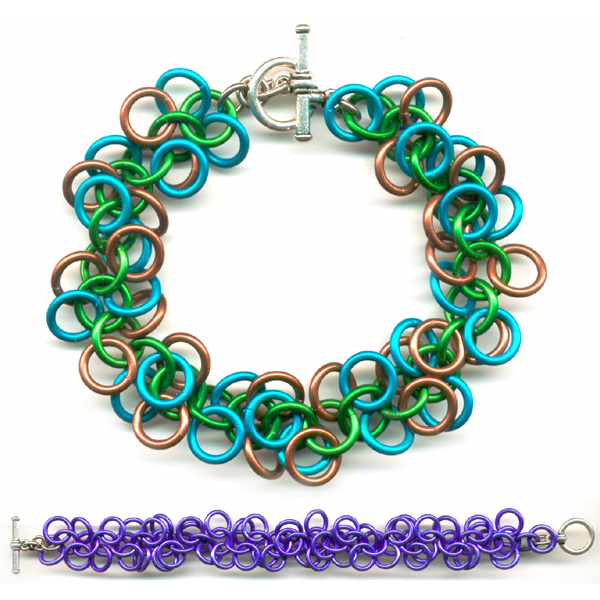 Chain maille can be very confusing to a newbie, and eyes start to glaze over real quick when one starts mentioning gauges and inner diameters and aspect ratio. Sure, Blue Buddha has a ton of kits at all skill levels, but for someone brand new to the craft, even that can be confusing. " So these kits will be an easy way to ease a beginner into this technique with great style! There is also a massive Scholar Pack which is based on the designs from the book. The most advanced project in this pack is the Rhondo a la Byzantine bracelet which the goal while working through the other projects. If you learn how to do the Byzantine and Helm weaves, both of which are suitable for beginners, then this is doable, never fear! If you would like to try chain maille, then this Shaggy Loops Kit and Tutorial (shown below) is up for grabs. It is suitable for beginners and most forgiving. The winner will be able to customize with 2 colors of anodized aluminum rings. The winner will be picked by Blue Buddha Boutique from the comments left on this blog. The contest is international and will close at 6 pm EST on Wednesday, November 21, 2012. Want more entries? Then hop to the following blogs to leave comments. Each blog will have one winner of the Shaggly Loops Kit and Tutorial! Please check their start dates as they are different from mine. There is also a Grand Prize! 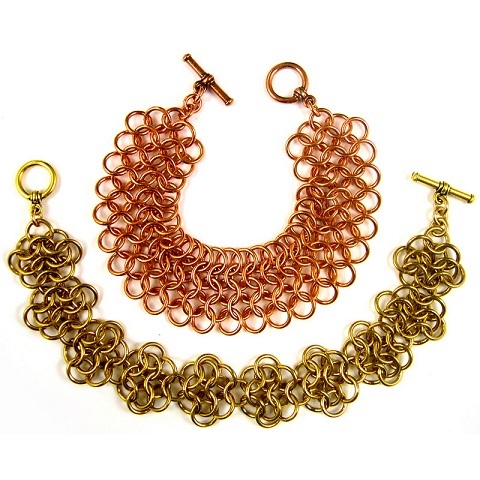 It will be the All-in-One Easy to Start Chain Maille Pack, shown below. 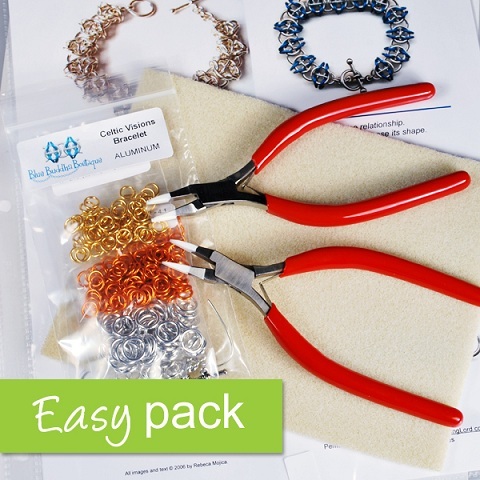 The pack includes tools, bead mat and the supplies to make a Celtic Visions bracelet. It's the only one of their starter packs to include pliers so there is no duplication of tools should you go on to purchase their other starter kits. To enter for that giveaway, please go to the Blue Buddha Boutique blog. This particular giveaway will run until November 28, 2012. I don't wanna be first because I doubt I'll win but I would love to have a chance anyway! Thanks! I would love to win this. I've been wanting to try chainmaille, but it is confusing to figure out what you need to start with and what an easy, good beginner pattern would be. Thanks. I'd love to win this. I go to Renaissance Faires and this would be great to accesssorize my dress. 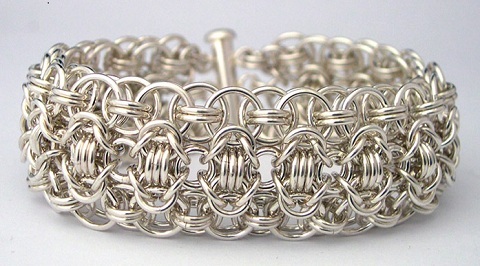 I have always wanted to learn how to do chain maille---it always looks so complicated. I would love to win this. It looks easy but when I tried it, it is really difficult. I hope to win this so that i can try it again. Excited about this giveaway!!!!! YAHOOO,( anyone remember the old "Yahoo00000" sound) I have been not looking forward to Holidays alone and the way the giveaway is set up give me something to look forward to each day. Cool idea peeps. Okay now is that an "rn" or is it an "m" ? and after that is it an "m" or maybe an "nn" or perhaps an "rn" ? And is that "ll" or ??? This is a great way for me to find out about other blogs. Chain Maille is so intriguing. The 21st is my bday - I'd love to get this kit as a present! Chain Maille is an amazing ancient technique that has become so much more versatile now that we have all these colors available! Pre- made kits are a great way to start. 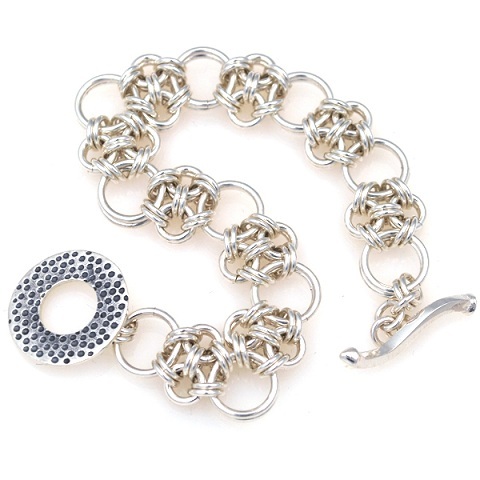 I think chainmaille is so cool! It always looks so pretty and complicated. I would love to be able to make this bracelet for someone for Christmas! Wow this is such a great giveaway!! I would love to try and learn this technique and this starter pack is just what I need! =) Thanks for the chance to win! What a great give-away. 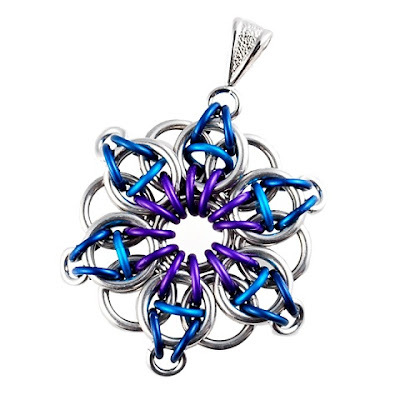 Would love to win, and learn more about Chain Maille. Thank you. Im part of a local Bead Group and the ladies there are always doing something chain maille related. I would like to try it, but have no clue where to begin, this is a great way to start and learn!! I was looking for something new to try and found Rebeca's book and was hooked. Then I found her website and was in love. I've never just picked up instructions and made something so easily before. I'm in love with Chain maille jewelry and am always looking for my next project. My friends have even started asking me to make items for them as well, so I may have found my side business ; ) Thanks for the opportunity to enter this giveaway, I love Blue Buddha Boutique!! I have bought rings from Rebeca several times and have always enjoyed creating pretties from them. Love her creativity with the blog hop. Keeping my fingers crossed. Chainmaille looks pretty simple, but I think that there's a lot to learn. I think this is a great idea for people to have the chance to learn this how to do chain maille.I've tried it a little bit,but like you said I was very intimidated.I am a biginner and I don't have a lot of supplies.I'm working on building up my stash.I buy a little bit here and there when I can.I've always wanted to make jewerly,but never had the opportunity.One day I had a little extra money so I went out bought some tools and beads and things and started making things.I've been hooked ever since.There is so much I want to learn,so if there is an opportunity to learn something new I'm there.I want to learn all there is to learn about making jewelry.So thank you for this awesome chance to try and win this kit.Thank you,Sara. Even if I don't win, I was introduced to something to give me inspiration and more knowledge about my obsession/hobby, I do hope to win of course, but either way I gain something new. I absolutely LOVE BBB! 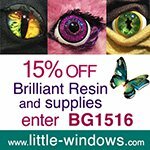 Their materials, selection & tutorials are the best & their customer service can't be beat! I live where I can't buy chain mail supplies in a store & rely on mail order, & BBB is my 1st choice. I can't wait to check out the other blogs. Awesome... I make my own links alot of the time as i always forget which ones i need when i am the store so i end up with wrong size or get frustrated with the choices... Love the fact there is a kit... as i just started about 5 months ago with chain maille this is great... Here is hoping i might get lucky. I'm still a beginner at maille and would love the opportunity to learn a new pattern and some supplies to play with. Love Rebecca's designs, thanks for the opportunity to win. Love Chain Maille....it gives me an outlet for my artistic side (and my frustrations!). Great giveaway! This is a fabulous idea, and leave it to BB to come up with it!! Love her stuff and chain Maile !! I would love a chance to win this kit. I am always looking to try new patterns but I rarely can afford to buy supplies. This kit looks beautiful! What a great way to bear into chain mail/maile! I absolutely love BBB! 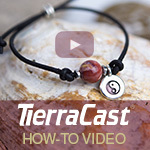 Great selection, fun tutorials, good prices & great customer service. I live where I can't easily find chain mail supplies in stores nearby, so I rely on mail order, & BBB is always my 1st choice. I'd love to get a chance to receive one of the kits. If not, I'm glad you're helping to spread the word about BBB. Oh yes, chain maille ! I would love to try that. I love chain maille, thanks to B3 and my bead shop owner. It challenges my brain in a big way. I want to keep upping my skill set. Love the Starter kit idea. Hope I'm not too late! I subscribe to your blog but I always save them til I have time to actually read. I really would love to learn how to make some of these! I love B3. 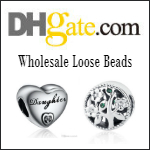 They always have the best quality supplies and the best customer service. I would love to win any of the prizes that are offered. Loosing a job means you can't buy millions of rings to play with so this would be great to keep my mind busy. Cheers to the best chainmaille suppliers in the world. So many comments! I doubt I will win but I will still try! That's always hope if I try! And I'm always game to try! Chainmaille kit-I try to win you and I hope I win! Yeeeessss!!!!! The photo of the intricate bracelet caught my eye. I have never seen jewelry like this and am thrilled to see it is something I could actually make myself! Pick me! Pick me!! Pick me!!!! Please!! I really want to try chain maille - hope I win. This looks like so much fun. I'd love to give it a try. I've tried on a few occasions with a bit of success, but I believe these kits would make it so much easier and I could be proud of my work then! I'd LOVE to win - I would be honored! I've been procrastination for so long about doing chain maille - this would be an awesome starting point! Hiya! My first time at your blog, very nice. I've been wanting to try chain maille, and this seems like the perfect opportunity. Thank you for having the giveaway. Blessed be, hugs!!! What a great kit! Thanks for the chance! Thank you for the opportunity to enter this contest.I have seen chain mail in books and I've made a couple pairs of earring and I have always what to learn how to make some intricate desings.So this would be an awesome opportunity have the supplies to be able to make some beautiful designs.Thank you,Melly. Would love to win this, and if not, big congrats to the winner! 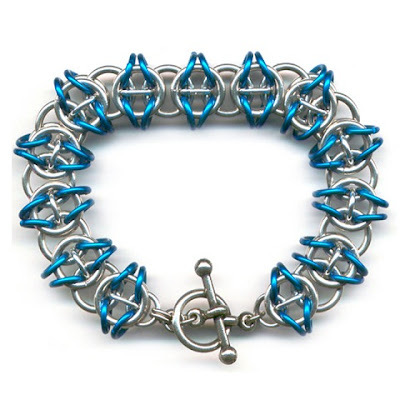 I love how easy blue Buddha is making it for people to learn chain maille. I have wanted to get into this medium for awhile but it can seem overwhelming! This would be so cool to win! Excellent idea by Blue Buddha Boutique. Well, ideas - both the kits and the blog hop. I always like finding new blogs. I would love to win this! I've never done chainmaille before and always wanted to try. Yeap! I'm a beginner. Always wanted to try was put off by all the technical details...which weave worked with which diameters, inside vs out side diameters, etc. Not going to wait to see if I win, although it would be nice. I'm getting my own starter pack to try. Chain maiIle always brings to mind Joan of Arc and the Middle Ages! The thought of learning a metal/wire technique that was used during this period of history is so exciting! 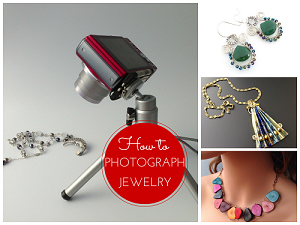 Your kit could be the inspiration for my "historical" jewelry-making phase! Thank you for the opportunity! How fun. Would love to learn to make these, thanks for the chance to win. I had no idea what beautiful pieces could be made until i visited this blog! What a unique way to increase my jewelry making skills. Would love to give it a try with this giveaway. Thanks. I'm very eager to win the kit because I really want to start chain maille-ing but I don't know what to buy to get started and I don't really have the money to buy the stuff! I especially like the Japanese Cross Bracelet! I'll have to look into getting that one! Love that Shaggy Loops! And thanks to you and Blue Budddha for the giveaway! Last year I was introduced to chain maille and I immediately fell in love. Thank you for this opportunity.